Since August 2018, 608 probable cases of Ebola have been reported in eastern Democratic Republic of the Congo (DRC). The Ministry of Health said 368 have died and 207 have recovered. The second largest Ebola outbreak in history is centered in North Kivu province, where 50 armed rebel groups are fighting for control of the region, driving families from their homes and complicating relief efforts. More than 54,000 high-risk contacts and frontline responders have been vaccinated, and health care workers are battling the severe, often fatal viral illness. UNICEF is part of that effort, with more than 50 specialists on the ground, operating out of Beni, Butembo, Mangina and Komanda. At least 400 children have been orphaned or left on their own when their parents or caregivers contracted Ebola and were taken to treatment centers or died. UNICEF and partners have opened a child care center next to an Ebola treatment facility in Beni, providing nutritional care and psychosocial and educational support for Ebola-infected children and infants, orphans and unaccompanied children. 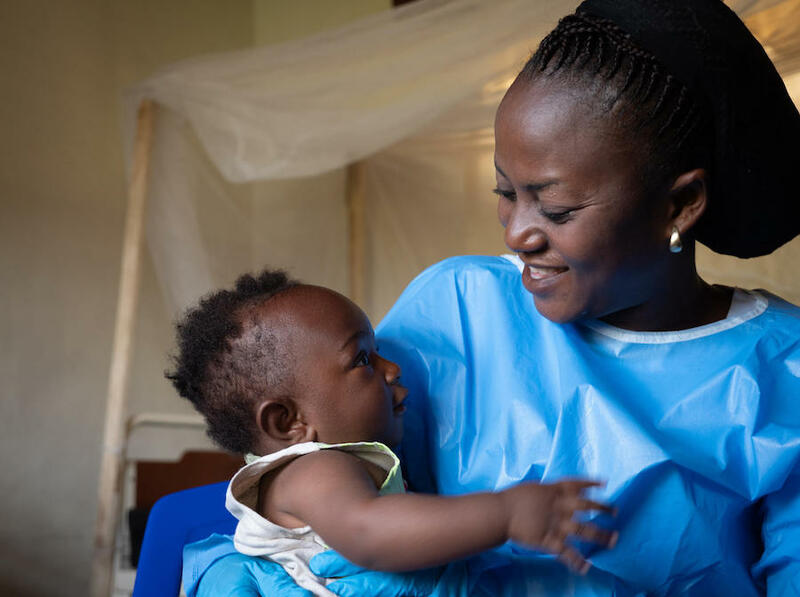 Ebola survivors are no longer susceptible to the virus, so some have become caregivers for the littlest children, providing the love and attention they need in their parents' absence. 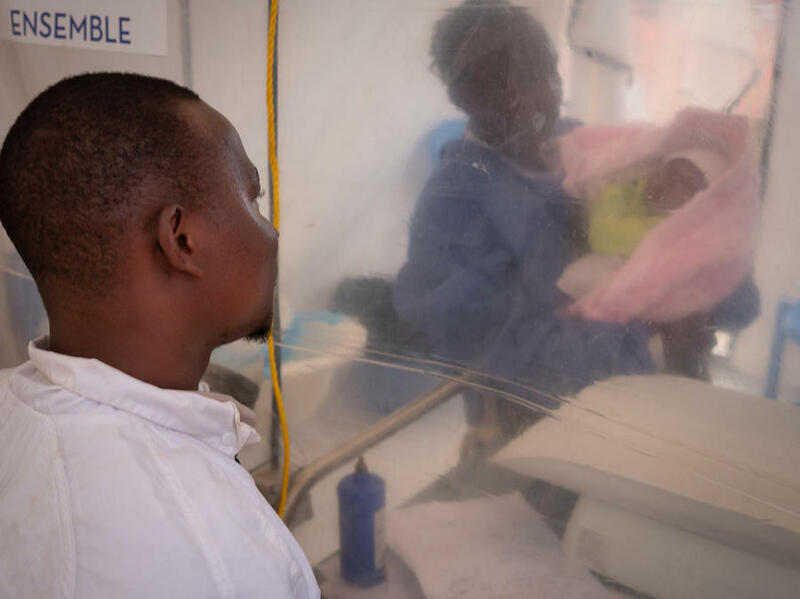 On 3 December 2018, a health care worker examines 1-week-old Benedicte in an isolation tent at an Ebola treatment center in Beni. Benedicte’s mother died of Ebola and she too is now infected. Over one-third of Ebola cases are children, and one in ten are under age 5. Ebola symptoms include fever, severe headache and, in some cases, hemmorhaging. Early intervention can significantly improve the chances of a patient's survival. 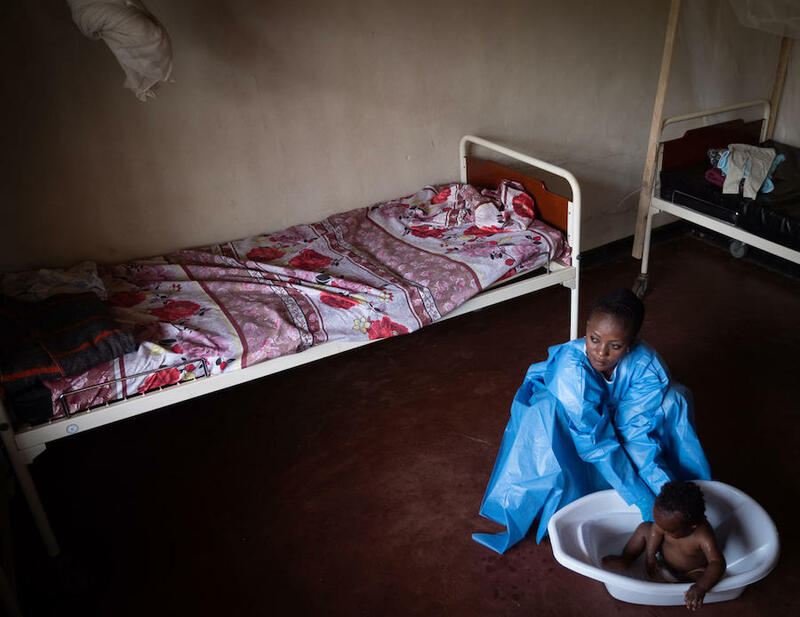 At the UNICEF-supported child care center in Beni, Kavira Langa Jemima, an Ebola survivor, bathes 6-month-old Josué, whose mother is undergoing treatment for Ebola. All the children at the center are monitored for signs of the virus and receive daily medical checkups. They also receive love and affection from survivors, who can cuddle them without risk of infection. Thomas Kakula Manole looks on as an Ebola survivor cares for his 1-week-old daughter, Benedicte. Children who contract Ebola are at higher risk of dying from the disease than adults. 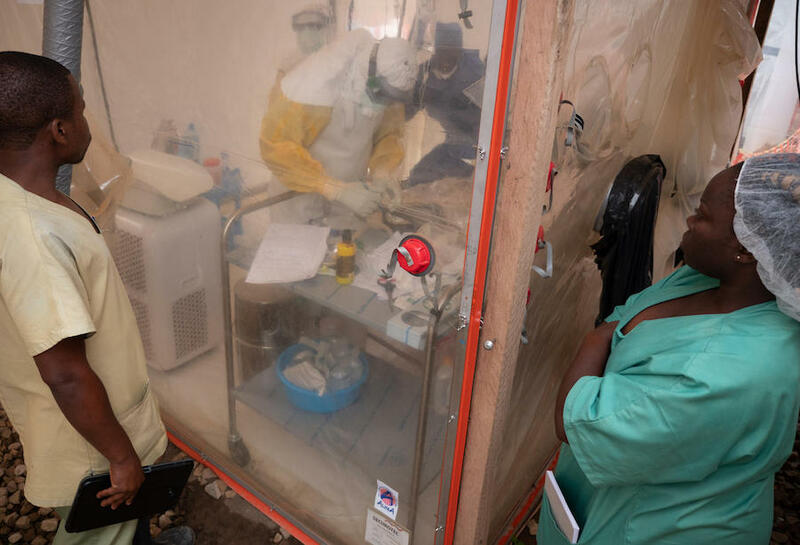 The World Health Organization reported last week that 18 health care workers have died of Ebola. Kavira Langa Jemima survived Ebola. Now she cares for little Josué while his mother is undergoing treatment for the often fatal disease. Hundreds of refugees have crossed into Uganda from the DRC since the country's contested presidential election in December, creating fears that Ebola may travel with them. Uganda has mounted a strong prevention campaign to stop the disease from spreading. An outbreak in West Africa in 2014 — the worst in history — killed more than 11,000 people in six countries: Liberia, Guinea, Sierra Leone, Nigeria, the United States and Mali.